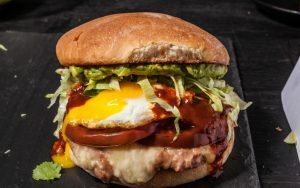 A fried egg with a gloriously runny yolk mingles with refried beans, red chile gravy, avocado, tomato, and Monterey Jack cheese for one of the most indulgently stimulating starts to the day we know. In a small saucepan, stir together the refried beans and a few tablespoons of the gravy. Stir until warm. In a frying pan, fry the eggs until done to your liking (I usually go for over medium so they’re slightly drippy). To assemble the sandwiches, spread the bean mixture evenly over the bottom halves of the rolls. Top with the cheese (melt the cheese under the broiler if you like), then the tomato slices, then an egg. Sauce it up with the remaining chile gravy. Sprinkle with some cilantro and the shredded lettuce. Spread the avocado slices evenly on the top halves of the rolls. Close the sandwiches, pressing down to compress them. Serve as-is or toast in a panini press or in a hot oven for a few minutes if you like. Traditional tortas are made with either crusty rolls called bolillos or softer buns called teleras, available in markets with a good selection of Latin American foods. A brioche or soft sandwich buns make fine substitutes.